I am a big pickle fan and off all the pickles I really like lemon pickle a lot when I didn't even start to cook I used to make lemon pickle how crazy that can be !! 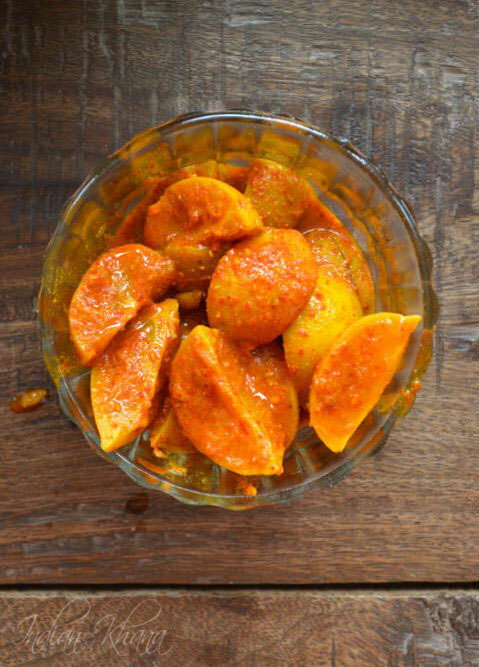 But then I stopped making it for some unknown reason though I still love lemon pickle or nimboo ka achar after all it's so difficult to say no to this tangy, spicy and tongue tickling pickle, I wouldn't say who can say no to this pickle cause personally I know few you do say no to lemon pickle. 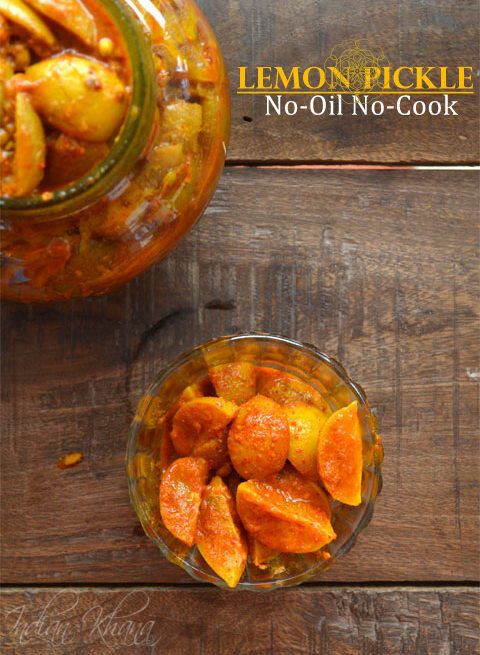 This is a very easy recipe with no-oil and no-cooking involve in this pickle and with only 4 ingredients, we just have to mix all the ingredients that's all it can't be simple than this. 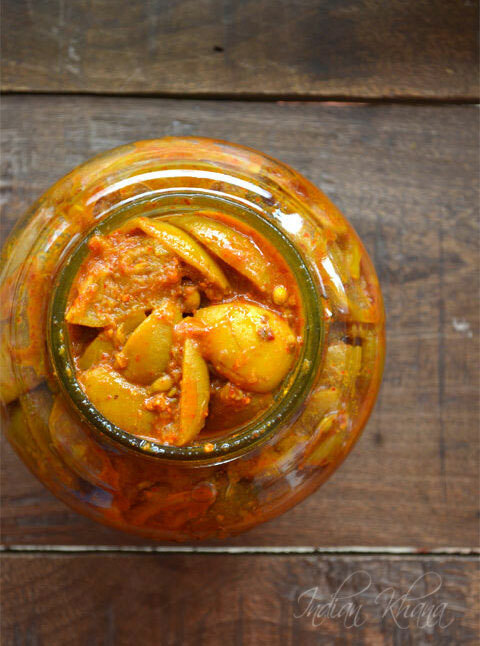 If you like to preserve lemon pickle for longer time say a year or more than you can add oil in this so the pickle stays fresh for longer time and of course if you are making it in large quantity. Read the notes section on how to do it. 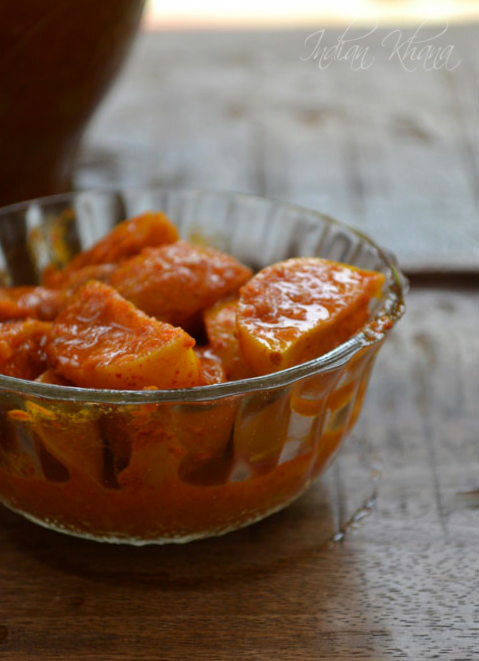 Since Onam is around the corner I thought this is best time to share this easy pickle recipe as lemon pickle is part of Onam Sadya. 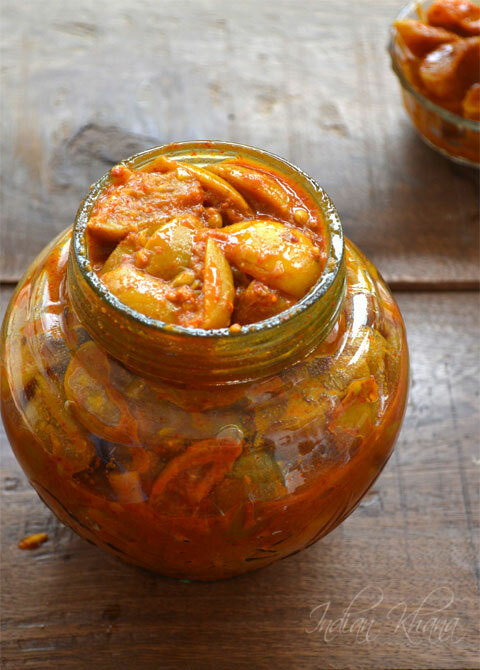 You can quickly make this pickle even in small quantity just for Sadya. Easy tongue tickling oil-free, cooking-free lemon pickle with only 4 ingredients. Wash well pat dry lemons and cut them in 4 pieces/wedges, place then in a large bowl or and add salt. Now mix well with hands to mix all the spices with lemon and all lemon wedges is coated with spices. Transfer prepared pickle in a large jar/ glass bottle or pickle jar, you should fill 3/4 of jar and not full as lemon and salt will release water later so don't fill jar until full. Keep the jar under direct Sun light for 8-10 days ie everyone morning keep jar under Sun light and evening keep jar in shape inside house. Our easy no-oil, no-cook lemon pickle is ready to eat now. You can do the same with lime. To preserve pickle for longer time add 1/4kg or 250ml of oil, heat oil well and allow to cool completely then add in pickle on 8th day. Keep in Sun for 2 days. You can also add 1/4kgs of slit green chili along lemon and follow same process to have green chili pickle too. Once in every month or two months check your pickle jar and shake it well, you can also keep jar in Sun light for one day. For daily use, kee pickle in another jar. Never use wet hand or spoon to handle pickle. 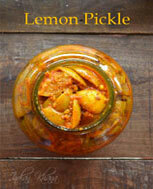 Lemon pickle at it's best have it with dal-chawal, curd rice, paratha, pakode or anything of your choice.